Home > Real Estate Events - Mumbai > MCGM’s Single-Window Clearance For Building Permits - A Game-Changer For Mumbai Real Estate? MCGM’s Single-Window Clearance For Building Permits - A Game-Changer For Mumbai Real Estate? 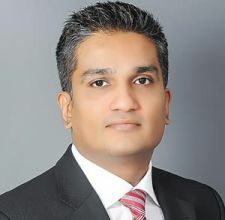 Mumbai’s real estate sector is cautiously optimistic about the new single window online application system for processing construction permits unveiled by MCGM, one of Asia’s oldest municipal corporations. As per MCGM’s assessment the system, if implemented, would result in a 52% reduction in the number of permissions required to obtain building approvals. If the reforms also succeed in bringing down the costs involved in obtaining permits, the resulting savings are likely to passed on to consumers, making housing more affordable and boosting the absorption of real estate in the city. Earlier, a building construction proposal in Mumbai required a series of approvals from about 30-35 different departments of the municipal corporation, the state government and various central government agencies. (See Exhibit A). 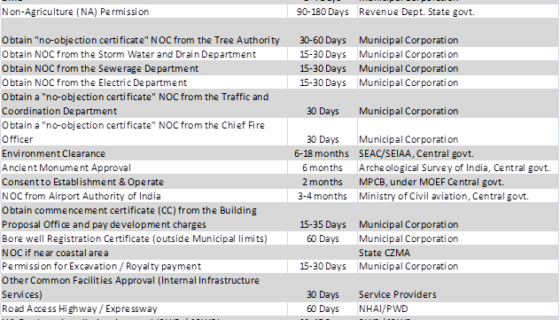 Under the new system, developers will require 58 certifications as against earlier 119, a reduction of 52% in number of approvals, no objection certificates (NOCs) and BMC remarks. MCGM expects that the new system will cut the approval timeline for a building project to 60 days as against the earlier 1-2 years. The reforms aim to drastically reduce the turnaround time for issuing construction permits, and envisage an overhaul of the existing permit workflow mechanism. Throughout the last decade, there has been a massive gap between new building proposals submitted to the MCGM for approval and the number of proposals that were given the final clearance – the BCC. On an average, 1500 projects have entered the system for approval each year, while MCGM granted only 730 OCCs and 118 BCCs. 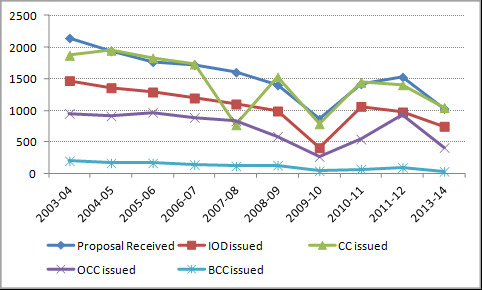 This suggests that there has been mounting backlog of projects which have yet to receive one or more approvals. There could be several projects which, despite receiving the IOD and CC, may not have received the OCC and BCC and will likely have to wait for a long time if they are to get the final approval at all. 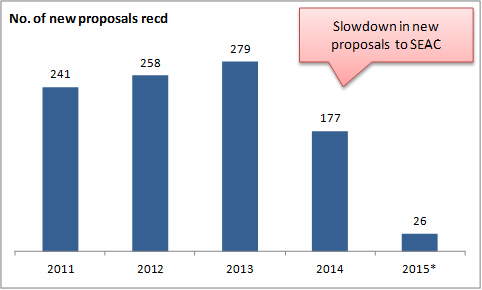 Shocking as it may seem, the building proposals that received OCC have averaged at just around 46% of the number of new proposals that entered the process for approval over the last decade. 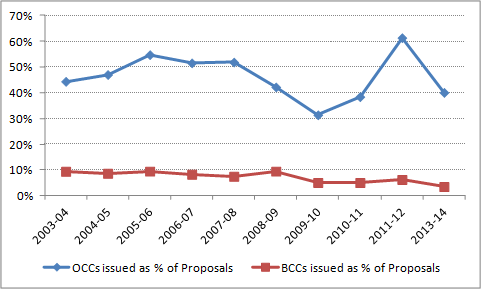 The proposals that received the ultimate approval of BCC averaged a mere 4% in 2013-14. 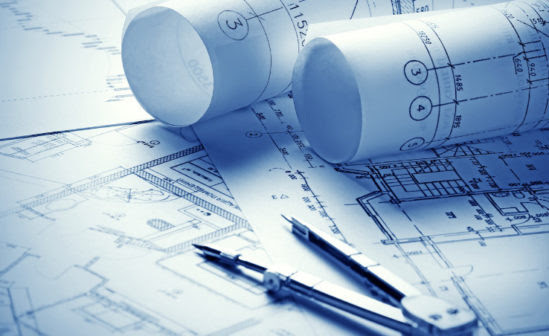 The reformed workflow mechanism would have to process not just new building proposals, but also cope with the massive volume of proposals that are pending further approvals. Many of the approvals required for a building proposal in the city are granted by state and central government departments. Mindful of this, Chief Minister Fadnavis has directed the MCGM to integrate all state and central government permissions within the single-window system. MCGM has started work on this front by integrating approvals from AAI and ASI, both central government agencies, within the single window system. However, some important processes are yet to be integrated – a point in case is environmental clearance. Presently, all building projects in the country having a total built-up area of 20,000 sq.m. or more (including FSI and non-FSI area) need to be cleared by the State Environmental Impact Assessment Authority (SEIAA) of the respective state. Amendments made to the law in January 2014 make it mandatory for developers in the state to first get all projects sanctioned by the local planning authority (MCGM) and only then approach the State Expert Appraisal Committees (SEAC II governs Mumbai ) and SEIAA to obtain environmental clearances. In effect, developers now have to obtain IOD from MCGM before approaching SEAC II and SEIAA for environmental clearance. Earlier, developers simultaneously approached both MCGM and SEAC II for clearances in order to expedite the approval process, which takes between 6-24 months. With the amended rules, the project approvals have been delayed further. The graph below plots the number of applications made to SEAC II to secure its recommendation for environmental clearance over the last 5 years. A sharp drop can be seen in applications dated 2014. Environmental clearance is just one of the many approvals required from state or central government departments. There are several other approvals that pose significant hurdles that are yet to be integrated, such as clearances from the State Pollution Control board, NOC from State Coastal Zone Management Authority (in case of CRZ land). Each of these clearances can take anywhere from 2-6 months. The single-window for permits would be only be truly effective if it brings all approvals and sub-approvals required from central and state government departments within its ambit. It is common knowledge that developers in the city employ significant resources – both human and financial – specifically for obtaining building permits from MCGM. The practice of employing generously remunerated ‘specialist’ staff with expertise in liaising with the labyrinth of MCGM departments is also well-known. According to the World Bank’s Doing Business report 2014, the costs incurred in obtaining construction permits in Greater Mumbai amount to an eye-popping 46% of the total cost of construction, as against 0.4% in Hong Kong and 0.3% in Singapore. This clearly indicates the abnormally high cost of obtaining permits in the city. This is a situation which a transparent, single-window would be expected to remedy. A reduction in project cost will provide developers the leg-room to bring down prices, leading to demand revival in the real estate sector. Another significant benefit of an IT enabled system would be the elimination of or reduction in the information asymmetry that currently plagues the real estate sector. Timely availability of building permit information to potential buyers would help avert situations such as the infamous Campa Cola case, wherein the residents of this housing project claim that they were unaware of the building’s legal status when they purchased their apartments. An IT-enabled system will empower citizens with timely and correct information on the approval status of projects, allowing them to make informed decisions. 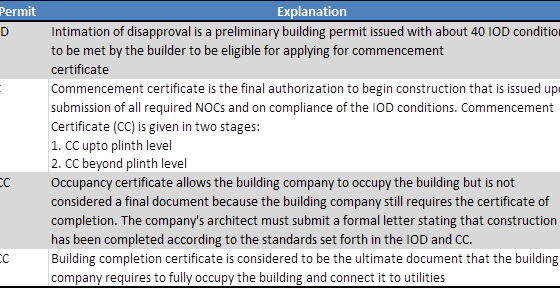 Whether the new single-window system succeeds in actually cutting the time required for obtaining approvals remains to be seen. That said, speedy implementation of the system would be a transformative development in the city’s real estate sector, and resonate with the ruling dispensation’s intent to boost the country’s ‘Ease of doing business’ rankings.